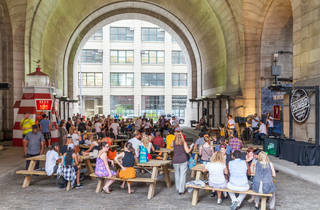 There are a ton of cool Oktoberfest events happening this month, but this is the only one (that we know of) that is bringing the German-themed party underneath the Manhattan Bridge Archway! 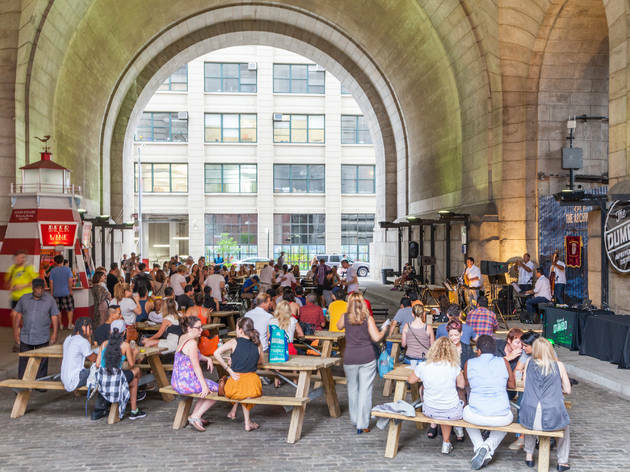 In fact, this is the DUMBO Business Improvement District's first-ever Oktoberfest celebration, which will transform The Archway into a traditional German beer hall, chock-full of musical performances, thematic eats and crafts! Melina and the Oompahs will provide polka tunes while dressed in customary costumes and DJ Holzmeister will be playing Bavarian tracks, including pop songs from Schlager to Neue Deutsche Welle. Get ready to bust a move on that cobblestone dancefloor! Savory bites and, of course, steins filled to the brim with beer will be served by The Lighthouse. Lederhosen-wearing servers will be dishing out pretzels, brats (veggie brats, too! ), sauerkraut and draft brews. And Creatively Wild Art Studio is supplying crafts for the kiddies (and big kids at heart) in the form of coloring books. The celebration goes on for three nights next month (Oct 6–Oct 8), but here is the official schedule below. Thursday, October 6 - 6:00 p.m. to 10:00 p.m.
Friday, October 7 - 6:00 p.m. to 10:00 p.m.
Saturday, October 8 - 3:00 p.m. to 10:00 p.m.
7:30 p.m. to 10:00 p.m.